Bogota, February 14, 2017. Avianca Cargo transported 11.200 tons of flowers between January 16 and February 7, 2017 for Valentine’s Day. With 175 flights exclusively dedicated to the transportation of flowers, the airline registered a 15% growth in volume of flowers transported this seasons for Valentine’s day in comparison to 2016. An additional 416 tons can be added to the direct cargo operation for flowers transported to Amsterdam through airlines with commercial agreements with Avianca. Some of the varieties of flowers transported from Bogota include roses, carnations and bouquets. Hydrangeas and chrysanthemums were exported from Medellin, while roses, gypsophila and alstroemerias were transported from Quito. The flowers were taken to Miami, where they connected with Los Angeles, New York, Tokyo, Melbourne, Sydney, Frankfurt, Sao Paulo, Madrid, San Juan, San Salvador, Brisbane, Aruba, Toronto, Seoul, Curaçao, London, Pekin and Shanghai. In a single day, Avianca Cargo transported 832 tons of flowers through the Miami International Airport. In order to meet the demand generated by Valentine’s Day, Avianca Cargo operated eight charter flights to Los Angeles (5), Miami (2) and one to San Juan de Puerto Rico. 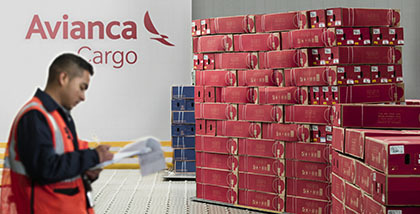 Avianca Cargo’s General Director, Andres Osorio, said: “At Avianca Cargo we are proud of the successful results of the season. Not only did we exceed the volume of flowers transported last year, we also showed the quality and professionalism of our processes that allow us to fulfill the needs of the flower industry in the region. It is gratifying to know that our team played an active role in the flower supply chain of countries around the world that celebrate this special date”.